Climate change impacts and responses are not gender-neutral; thus, climate financing mechanisms and resource allocations meant to address these differentiated impacts must be gender-responsive. Women’s direct participation in climate change decision making, including in governing bodies of climate finance mechanisms, is a crucial aspect to effectively and equitably designing, implementing, and funding climate solutions. A gender-responsive climate finance architecture can play a profound role in supporting a comprehensive climate change framework—and complementary sustainable development pathway—that promotes an equal and resilient economy for women and men. Historically, climate finance has had limited focus on and benefit for the poorest and most disadvantaged populations within developing countries, and for women in particular. This exacerbates vulnerability and climate injustice, and overall reduces the resilience of nations to the impacts of climate change. 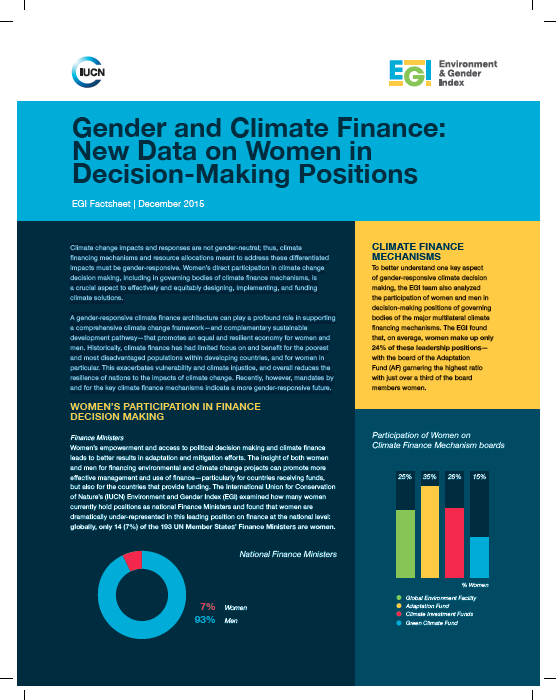 Recently, however, mandates by and for the key climate finance mechanisms indicate a more gender-responsive future.